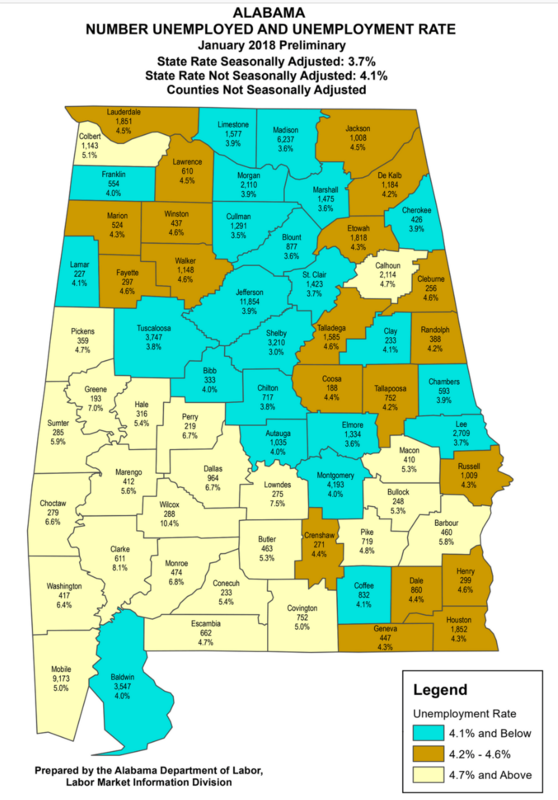 Alabama’s unemployment rate is down to 3.7 percent — a new record low. The state released preliminary, seasonally adjusted numbers Monday morning showing the jobless rate declined one-tenth of a percent in January from December’s revised rate of 3.8 percent, well below January 2017’s rate of 5.5%. January’s rate represents 80,841 unemployed persons, compared to 82,378 in December and 120,788 in January 2017. The U.S. jobless rate continues to hold steady at 4.1 percent, making Alabama’s unemployment rate is four-tenths of a percent better.